The Regional Till Geochemical Mapping data set gives information on the concentrations of 37 elements in unaltered basal till. The samples have been taken, in 1983, from an unaltered basal till (C horizon) below the groundwater table at a depth of ca. 70 cm (variation 50-200 cm) with a density of one sample per 300 km2. 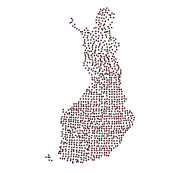 The data set covers the whole of Finland with a total sample amount of 1056. The samples are composite field samples. The calculated sample point coordinates entered in the data set have been obtained from the centroid coordinates of five subsamples. The subsamples have been collected from a 300 m x 1000 m rectangular-shaped area. In Northern Finland, samples have been obtained by including samples taken previously in the Nordkallot Project. The samples have been sieved for analysis at a grain size grade less than 0.06 mm. The samples have been analysed for total elemental concentrations and aqua regia concentrations. Total concentrations have been determined either by neutron activation analysis (method code 900N) or by total dissolution with strong concentrated mineral acids (method code 312P). The analysis code for aqua regia dissolution is 511P. Gold and palladium have been determined with a analysis method based on flameless atomic absorption (519U). The sulfur concentration has been determined with a LECO analyser (810L). Further, total concentrations (312P) and aqua regia soluble concentrations (511P) were determined from Southern Finland and Mid-Finland samples with a grain size grade less than two millimetres. The original purpose of the Regional Till Geochemical Mapping data set was national geochemical general mapping and ore exploration. Other uses are, for example, estimating the baseline concentration of the soil, the nutrient levels of forest soil, assessing the buffering capacity of base cations in the soil and evaluating the weathering rate. The coordinates of the samples have been determined from 1:20 000 base maps or from smaller scale maps. The coordinates represent the centroids of the 300 m x 1000 m sized sampling area. The centroid may contain some other soil type than till. Other information is based on chemical analyses taken from the composite field samples. Sampling, processing and analysis methods have been described in the Geochemical Atlas of Finland, Part 2, p. 14-26 (Koljonen 1992). The samples have been taken, in 1983, from an unaltered basal till (C horizon) below the groundwater table at a depth of ca. 70 cm (variation 50-200 cm) with a density of one sample per 300 km2. The data set covers the whole of Finland with a total sample amount of 1056. The samples are composite field samples. The calculated sample point coordinates entered in the data set have been obtained from the centroid coordinates of five subsamples. The subsamples have been collected from a 300 m x 1000 m rectangular-shaped area. In Northern Finland, the samples have been obtained by including samples taken previously in the Nordkallot Project. The samples have been sieved for analysis at a grain size grade less than 0.06 mm. The samples have been analysed for total elemental concentrations and aqua regia concentrations. Total concentrations have been determined either by neutron activation analysis or by total dissolution with strong concentrated mineral acids. Gold and palladium have been determined with a method of analysis based on flameless atomic absorption. The sulfur concentration has been determined with a LECO analyser. Further, total concentrations and aqua regia soluble concentrations were determined for Southern Finland and Mid-Finland samples with a grain size grade less than two millimetres. The element concentration data includes a numerical concentration value with a unit mg kg-1, i.e. ppm, and possibly a check mark. The concentration is recorded as a variable, which has a name that consists of the chemical symbol for the element and the code for the method of analysis. For example YB_511P is ytterbium (Yb) concentration, which is determined by dissolution in aqua regia. The next variable is a check mark, for example YB_511PT. If the numerical value following the check mark is ‘>’ or '‘<’ then the number recorded in the concentration field is the detection limit of the chemical method and the actual concentration is less than this value. At times there is no information on the detection limit and a zero has been entered in the data field. Analytical results that were obtained from Southern Finland and Mid-Finland samples with a grain size grade under two millimetres are entered into a different file. The samples have been taken with a shovel or percussion drilling equipment. The composite field samples have been dried in the laboratory and sieved at <0.06 mm or <2 mm grain size grade. The samples have been analysed for total elemental concentrations and aqua regia concentrations. Total concentrations have been determined either by neutron activation analysis or by total dissolution with strong concentrated mineral acids. Gold and palladium have been determined with a method of analysis based on flameless atomic absorption. The sulfur concentration has been determined with a LECO analyser. 3cb8f375-202c-4671-bffb-51f9a64d8aca Access to the portal Read here the full details and access to the data.